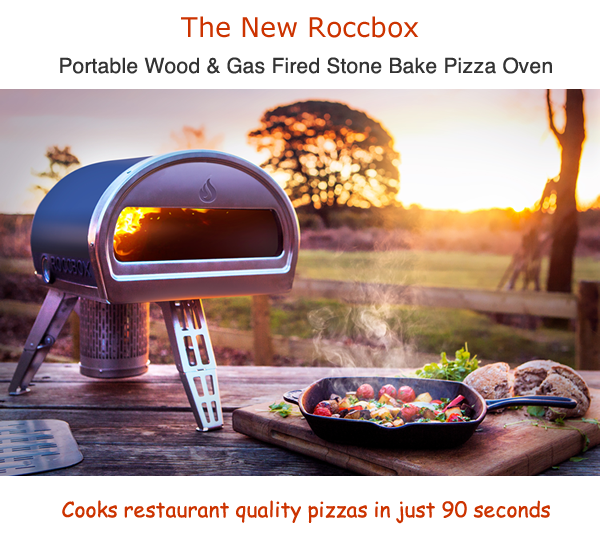 Where can I buy the new Roccbox pizza oven? Expected availability in the UK – June 2016 retailing at £399. As the warmer weather arrives there’s soon the urge to get out in the garden and fire up the barby. Al fresco dining has become a popular event over the years and much loved by many who enjoy the combination of fine food and friends. 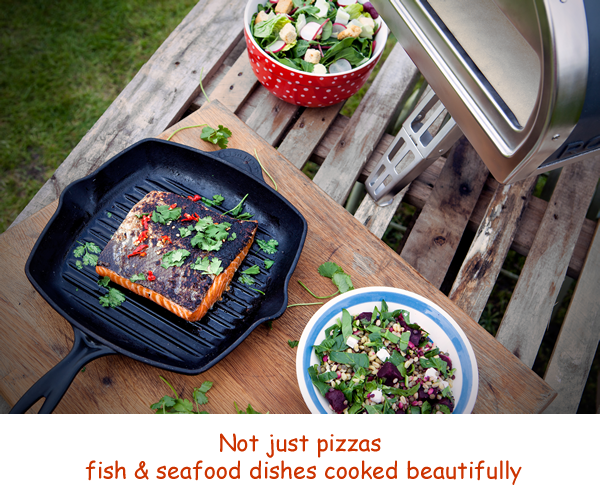 2016 is set to make outdoor cooking an even better experience with the new duel-fuel Roccbox. 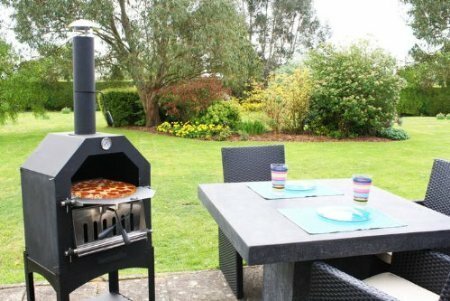 This portable stone bake pizza oven is an exciting piece of kit that does away with badly charred food. Instead this new innovation promises to deliver perfect results in a fraction of the time it would take in the oven. Whether using gas or wood it’s the intense cooking environment and clever design that mirrors a traditional stone bake oven. The Roccbox is a compact wood and gas fired stone floor oven. It has folding legs and is light enough for one person to carry around. Take it anywhere, the beach, on picnics, in the garden or on camping holidays. There are heat two settings, once lit the heat radiates evenly reaching its cooking temperature in just 15 minutes. The unique style pizza oven cooks Neapolitan pizzas to perfection in under 90 seconds. There is also an unlimited range of meat, fish and vegetable dishes that can be cooked including the sunday roast. Small in size with a sleek design means evens the smallest of gardens can find room. Wood fired cooking delivers amazing flavours. Look forward to sizzling cooked food such as gourmet burgers in 60 seconds. Or try cooking your own stone baked pizza from scratch. Add all your favourite ingredients put on a tray in the Roccbox, rotate a couple of times and after 90 seconds get set to taste the best ever pizza! Other delicious foods to savour include roast potatoes, chicken, fluffy baked breads and caramelised meats. There’s also succulent fish with crispy skin, garlic king prawns and hot smoked salmon that can be produced in minutes. Available in a choice of two colours. The eye-catching grass green is sure to impress your friends. For something a little less obvious there’s the understated hue of stone grey. 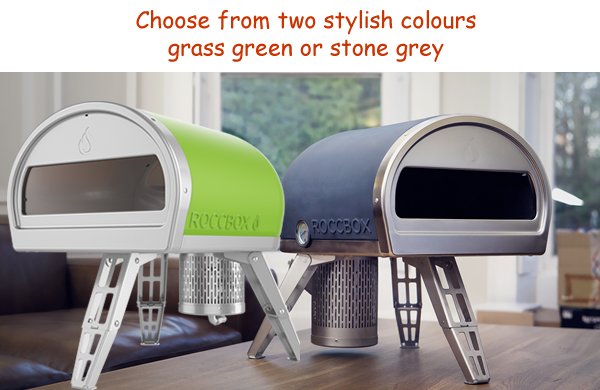 When the Roccbox comes on the market in the UK there will be all you need to get you started. Included in the box will be the following: built-in thermometer, gas burner attachment with hose, wood burner attachment. commercial grade pizza wheel, carry strap, instruction manual with recipes and bottle opener.